Current, powered by GE, and Jones Food Company announced that construction is underway toward building one of the world’s largest indoor farms. The intensive plant nursery, located in North Lincolnshire, England, will be producing up to 420 tonnes of leafy greens per year across a growing area of 5120m2, arranged in racks rising to the height of 11m. 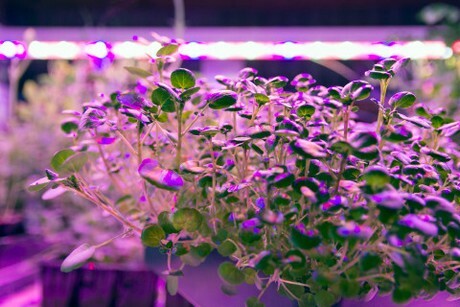 To maximize the facility’s yield, Current by GE is installing more than 12Km of its new Arize LED horticultural lighting solution, with a balanced light spectrum that catalyses optimal growth in every plant and shortens the growth cycle for more intensive production. The equipment is housed within a futuristic, intelligent cleanroom (or “high-care”) environment that allows crops to be grown in complete isolation from external contamination – suitable for food production as well as growing cosmetic and pharmaceutical ingredients. Production of the first crop from the Jones Food Company operation is due to start in autumn 2018. With a growing area of 5120 m2, the equivalent of 26 tennis courts, arranged across racks rising to a height of just over three storeys, the facility – owned and operated by JFC – will set new production and environmental standards for crop production of the future. With year-round local production JFC aims to slash food miles and produce leafy greens, herbs and other crops that can be delivered from harvest to plate in minimal time. In addition, by designing the farm as a “high-care” facility, JFC will also be able to cater to the growing demands of cosmetics and pharmaceutical customers who require reliable supplies of natural ingredients. Every factor in the growth of the crops produced will be highly controlled; from the nutrient solution delivered to the roots of each and every plant, to the concentration of CO2 in the room, to the light wavelengths and duration of the growing “day” and subsequent rest period. Thanks to intelligent automation and advanced robotics, every plant can be grown in ideal, cleanroom conditions, untouched by human hand from planting to harvest. By comparison, conventional production cycles typically average 13 stages of human contact.